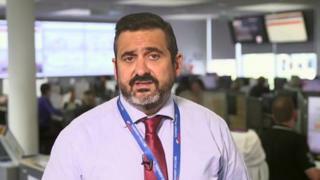 British Airways' boss Alex Cruz has unashamedly always had an eye on costs. The 50-year-old married father-of-four joined BA as chairman and chief executive last April from Spanish budget airline Vueling. At Vueling, Mr Cruz had proven he could compete with rival budget airlines such as Ryanair and within two months of taking over at BA, he announced plans to outsource its 900-strong technology department to India. He tackled expense elsewhere by cutting complimentary snacks and drinks on flights of five hours or less leaving passengers to buy Marks & Spencer's sandwiches and refreshments on board. Meanwhile those in economy on flights of up to eight and a half hours only get one meal now instead of the previous two. Earlier this year, Mr Cruz told Skift magazine: "We're always going to be reducing costs... It's now injected into the DNA. If one particular day we don't come up with an idea to reduce our costs, then we're not doing our job." Mr Cruz began his airline career 22 years ago at American Airlines where he spent half his time working at its travel technology arm Sabre which automates the way the company books reservations. He founded his own airline, Clickair, in 2006 which merged with Vueling three years later where he was chairman and chief executive before it was snapped up by International Airlines Group (IAG), the parent company of BA, in 2013. His move to BA had been viewed by some as a sign that he was being lined up to eventually take over the running of IAG from the redoubtable Willie Walsh. Mr Cruz may have experienced a sense of déjà vu this weekend amid the travel chaos at Heathrow and Gatwick. After he left Vueling, the airline experienced severe delays and flight cancellations that left thousands of passengers stranded and his successor, Javier Sánchez-Prieto, blamed him for the problems. In an email to staff that was leaked in the Spanish press, Mr Sánchez-Prieto said: "I must say the first thing I encountered were some weaknesses in the planning of the operation" adding that many of the problems" stemmed from "an internal origin". It was reported Mr Cruz received no bonus for 2016, becoming the only senior member of management at IAG, not to be rewarded that year. Shares in the company, which are traded in the UK and Spain, quickly recovered from a fall of more than 3% on the Madrid stock exchange on Monday. But will investors in London be minded to give Mr Cruz the same pass when the market re-opens from the Bank Holiday on Tuesday morning?